The last horse through the ring in the penultimate session of the 2017 Keeneland November sale was a chestnut son of Street Cry. Named Street Jersey, he was consigned as Hip 3914 by Hunter Valley Farm as a stallion prospect. Street Jersey accumulated a record of 1-1-4 and earnings of $69,750 from seven starts for breeder Charles Fipke. While not as successful on the track as his dam, the multiple grade 1 winner Jersey Girl, or his half brother, grade 1 winner and sire Jersey Town, the now 6-year-old exited the ring without a bid. But he didn't go completely unnoticed. As Lauren Burke arrived at Keeneland that day, her friend called her to take a look at Street Jersey. "She called me and I was trying to park my car, and she was like 'You've got to get down here, I really like this horse,'" Burke recalled. "I met them at the barn and I looked at him for 30 seconds. I thought he was really interesting, kind of a different type, and had a really nice look in his eye. (I) made an offer on him and the rest is history." The journey Street Jersey was about to begin was probably not what his connections envisioned for his future when they entered him into the sale. 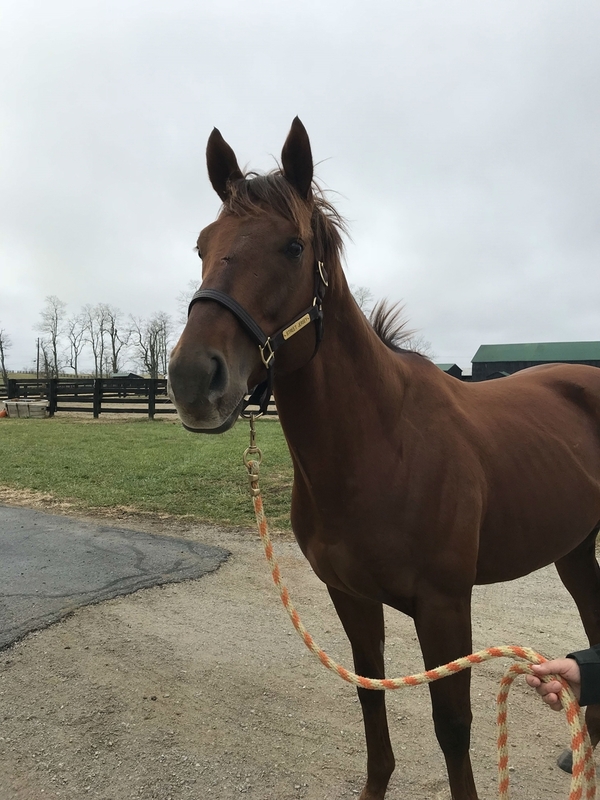 Burke, who is the equine manager at the Life Adventure Center near Versailles, Ky., purchased the retired runner as a prospect for the 2018 Thoroughbred Makeover. He'll have some big shoes to fill as Burke's Makeover competitor last year, Woodford Channel, took home the top prize in both the field hunter and freestyle disciplines. "Last year I won the freestyle and the field hunters, and field hunting was newer to me. I kind of used the makeover as the reason to get into fox hunting and it was a lot of fun," she said. "I'm secretly harboring a hope that (Street Jersey will) want to be a ranch horse or something since the western disciplines seem like a lot of fun, and he's a big sturdy type, but I'll work with him for a long time before I decide." But before he gets to this year's Makeover, Street Jersey could make a positive impact on individuals who participate in the Center's programs. "I get to share my horses with the Life Adventure Center throughout the year," Burke said. 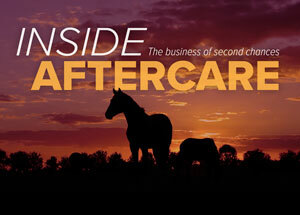 "It's cool because we do some experiential education and resiliency programs for different groups—a lot of at-risk kids, abused women who are recovering, veterans with PTSD—so the Thoroughbreds are kind of uniquely well-suited to that. They're very sensitive, they're expressive, they're emotionally intelligent. "'Woody,' who I did the Makeover with this past year, in addition to being trained by me, got to influence the lives of a lot of different people, and a lot of different people got to have a safe and empowering first horse experience." In addition to its equine programs—which can range from herd observations, groundwork, trail riding, and vaulting—the center also offers a number of non-horse activities, including high and low ropes courses, canoeing, and archery. For now, Street Jersey is settling into his new home while Burke continues to evaluate him to decide what discipline he might be suitable for. "We've just been letting him get settled in and getting him used to the whole routine," Burke said. "The more I do with him, the more I really like him. I think he's got a nice personality, he's very confident ... he's incredibly smart, he's an athlete, and I'm really looking forward to working with him all year."